Imagine the ancient Silk Road which connected China to Europe. For centuries, traders passed through the rich cultures of Northern India, Punjab, Persia and Turkey as they traveled East and West. Along the way, recipes were shared and refined. Pilaf, as we know it, or Pulao, as Indians call it, is one such dish. 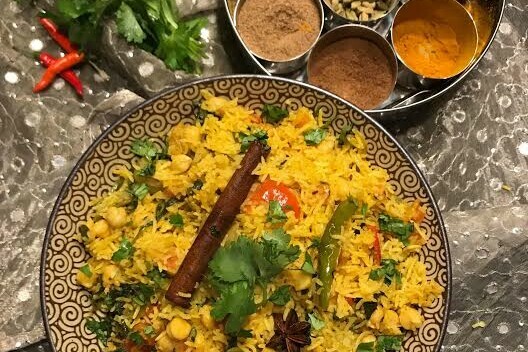 A staple in Northern Indian cooking, Pulao and its cousin Biryani, are dishes in which rice and meat or vegetables are cooked together with fragrant spices. Pulao is a delicious one pot meal which is impressive enough for company and easy enough to become weeknight comfort food. Just in time for cold weather, Chef Lalaine Gunem, a frequent cooking teacher at Forage, and Angie Nijhawan will walk you through the preparation of these flavorful and nutritious dishes. $55 per person; wine and Lazy Monk beer available for purchase by the glass.